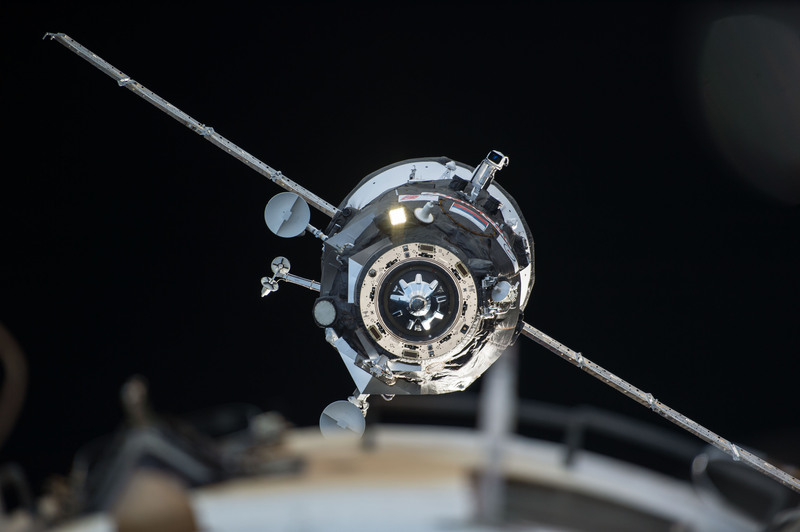 iss042e274677 (02/17/2015) – The Russian Progress 58 cargo craft pictured shortly before docking to the aft end of the Zvezda service module on the International Space Station. A reboost of the International Space Station using the Russian Progress 58 cargo craft was completed successfully on Sunday at 7:30 p.m. CDT. A previous attempt on Friday evening was aborted one second into the burn automatically by the Progress vehicle. Russian flight controllers identified an issue with one of the eight thrusters on the spacecraft that was disabled for Sunday’s backup attempt. The burn lasted 32 minutes and 3 seconds and began the process of setting up the correct phasing for the early June landing of three members of the Expedition 43 crew while providing the proper trajectory for Thursday’s return of the SpaceX Dragon cargo craft for its parachute-assisted landing in the Pacific. The reboost raised the station’s altitude by 1.2 statute miles at apogee and 3 miles at perigee and left the station in an orbit of 252.2 x 247.1 statute miles. The six-member Expedition 43 crew started its work week with medical science. The crew practiced using a tonometer on an eye simulator with help from doctors on the ground. Similarly, One-Year crew member Scott Kelly explored how microgravity shifts fluids to the upper body impacting a crew member’s vision and eye structure. Finally some good news from Russia.